23 resin parts; photo-etched fret; acetate sheet. Very highly detailed; cast to the highest standards; appropriate use of multimedia parts. An excellent upgrade to Hasegawa's 1/48 scale Zero kits. SBS Model is based in Hungary. 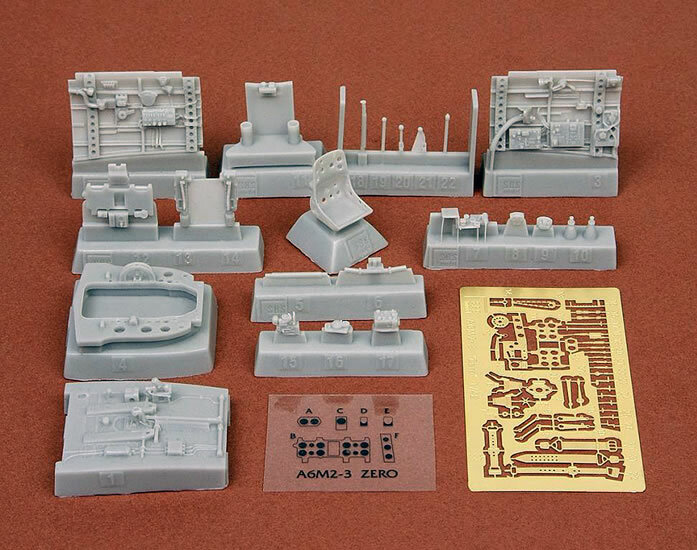 It produces first rate modelling tools, resin upgrade sets and masking foils. 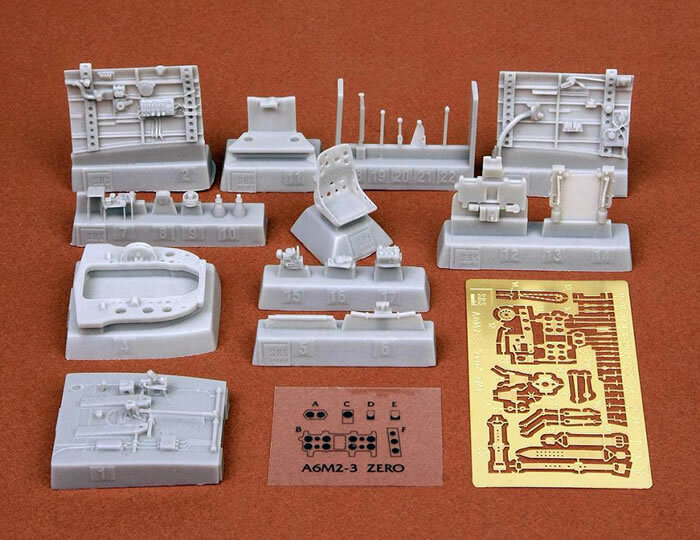 They have recently released two new detail sets for the Hasegawa 1/48 scale series of Mitsubishi Zero kits. 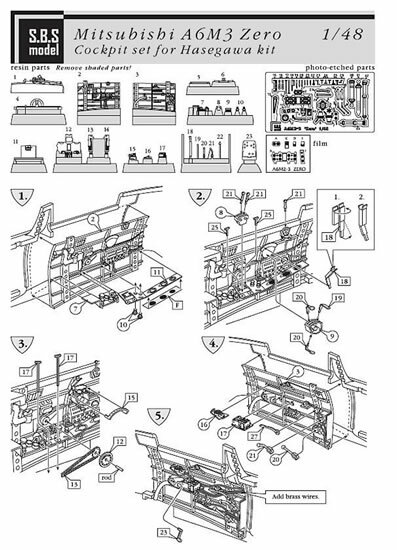 48028 is for the A6M2 (Zeke) whilst 48029 is for the A6M3 (Hamp). Your get 23 resin parts, 33 etched brass parts and a small acetate foil that carries the instrument panels. These same parts are present in both offerings. The parts are crisply cast and exhibit a wealth of detail that can only be truly appreciated once they have been painted and dry-brushed. 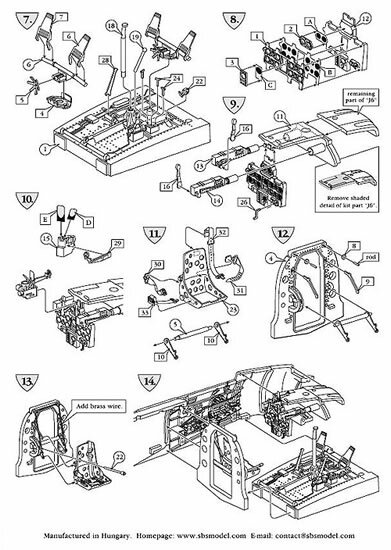 I could not find a single pin hole in any of the 23 parts. The etched brass parts too are very well done and the detail on them is crisp enough to still be visible under a thin coat of paint and a wash. 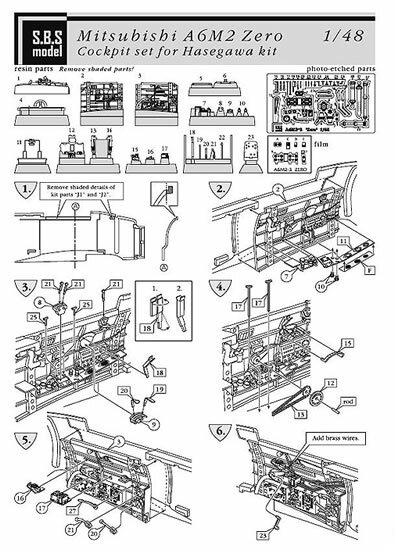 The instruction sheet is a small affair that carries black and white line exploded view line drawings on both sides. Packaging is via two clear plastic zip-loc bags (one for the resin parts and one for the brass fret and acetate). The bag holding the resin parts is wrapped in a small piece of bubble plastic. These two bags and the instruction sheets are in turn are packed into a thin cardboard end-opening box. These are very nice update/detail sets indeed. My previous experience with S.B. Model detail sets (48027 1/48 N1K2-J Shiden-kai (George) cockpit set for the Hasegawa kit) was positive, and as with all resin cockpit upgrades you need to exercise care when separating the parts from their casting plugs and just as much care when modifying the kit parts to accept the resin ones but you will be rewarded by the end result. Thanks to S.B.S. Model for the samples.